Home → Blog Posts → Making the Sausage: just what goes into a Christmas Revels? 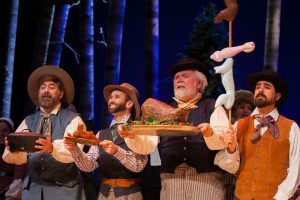 Making the Sausage: just what goes into a Christmas Revels? 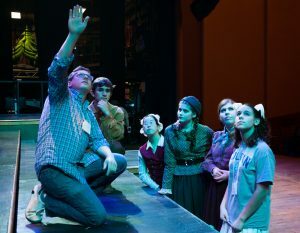 Colin working with cast members during the 2017 Christmas Revels. Photo by Ryan Maxwell Photography. The title of this post could easily refer to a prop we’ve got in mind for this year’s production. Indeed, our selection of fake meats — from the Boar’s Head that will once again make an appearance in 2018 to the côtelette de veau bien rôtie sans os (boneless veal cutlet well roasted) produced in last year’s Québécois Revels — is mouthwateringly delectable. That is, unless one is a vegetarian or allergic to painted Styrofoam. However, the sausage here is of the metaphoric sort. Those who have been on or backstage in a Christmas Revels can surely appreciate the time, effort, sweat (and alas, sometimes tears) that are required of the hundreds of folks who contribute to this epic production. And while effort is surely required, time is our most valuable commodity. Members of the chorus know that auditions for the show occur in late May. That’s nearly seven months before opening! That should be enough time to put this thing together, right? Nope. Being a community organization, our goals in creating each show are not the same as someplace like the Shakespeare Theater or Washington National Opera, each with an extensive staff of professional craftspeople. Our joy is in bringing the community together to create the same quality show. That often means having a longer view of the creation, knowing that the joy is as much in the process as it is in the product. Quite frankly, a fake Boar’s Head appropriate in size and scale isn’t available on Etsy (at least not yet), so somebody’s got to build it — and Revelers are exactly the kind of people who would be up for it! 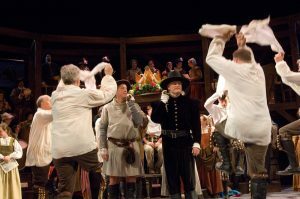 The Boar’s Head onstage in the 2007 Elizabethan production. Photo by Sheppard Ferguson. As the production staff began to think through this year’s show (we started talking in earnest in December of last year, in fact during the second week of the Québécois production), one of our determining factors was who would be available to help us create the production. This process actually began almost a year earlier when we asked Mark Jaster, Sabrina Mandell, and Katrina Van Duyn to keep December 2018 free on their calendars. These folks are in high demand, so before we commit to Will Kemp and Queen Elizabeth, we ensure that the folks to play those parts are available! The same is equally true of many of the specialists who join us from one year to the next. An equally important element of the who is our corps of volunteers that creates our props, merchandise and costumes each year. However, relying on volunteers requires the production staff to think far in advance such that we can use their help. 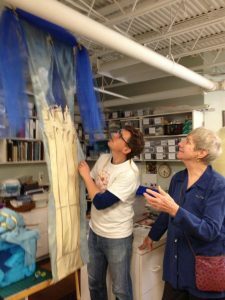 In June, Costume Designer Rachael Feola made a trip to the Ohio Light Opera Company to borrow several dozen costumes to use in this year’s show. Costume Shop Manager Sandy Spence and the costume shop are now in the process of altering those pieces to fit our show (and our chorus)! They will begin to enlist the help of Revels volunteers very soon. Styrofoam prop dishes from the 2017 Québécois Revels. Photo by Ryan Maxwell Photography. Likewise, Artistic Director Roberta Gasbarre and I have been reviewing our existing stock of banners and signs so that we can create both the streets of Norwich and the interior of a Tudor guild hall. We’ve discovered that we could really use some extra guild signs to create our streetscape. As we launch into the production in earnest this fall, we’ll be enlisting the help of our talented group of volunteers to create these signs. Colin and Mary Gene in the Revels costume shop. Revels did indeed own a pig’s bladder, but over the years it had dried out and cracked. It needed to be replaced if we were going to have a real pig’s bladder for our Fool. Roberta thought this was would be a fun volunteer project. I must have agreed, because I fired off an email to Mary Gene Myer, longtime Reveler, Advisory Board member, and my usual go-to when I need a suggestion on where to start an unusual Revels project. Click here to learn more about this year’s Elizabethan Christmas Revels! May Day! May Day! — How Will You Celebrate? Revels® and Christmas Revels® are federally registered service marks of Revels Inc., Watertown, Mass.